I braved the cold and fished with Nick today, the portable hut made it very comfortable. There’s 8 to 9″ of clear hard ice in the bays, with just a few inches of light fluffy snow on it. Good safe conditions. Started off fishing a shallow bay close to the resort in about 5′ of water. Fish started coming in as soon as we set up, and they were ON. No messing about, just hitting our jigs tipped with a bit of worm. It stayed constant for most of the morning. Lots of action and pulling away from lots of smaller trout. It eventually slowed down, then a move to the next deeper break, about 8′ deep, clean bottom. 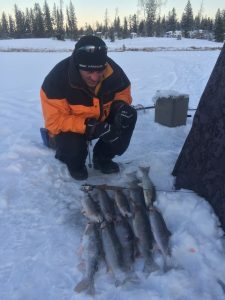 Started to get them, but more often the trout would come in a few times, before deciding to hit, but many just toying with us, not hitting hard. As soon as the sun dipped behind the hills, the fish turned on again, lots of fish in feeding again. A great day on Tunkwa, with us each keeping a limit and releasing lots for the next anglers. Looks like the cold streak is going to end this weekend, and back to more normal temperatures. Our limits of 16″ trout, bound for the smoker.